In preparation of our CCNA exam, we want to make sure we cover the various concepts that we could see on our Cisco CCNA exam. So to assist you, below we will discuss the EIGRP routing protocol. The rate at which EIGRP sends hello packets is called the hello interval, and you can adjust it per interface with the ip hello-interval eigrp command. 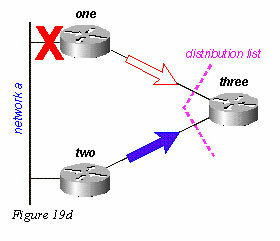 The hold time is the amount of time that a router will consider a neighbor alive without receiving a hello packet. The hold time is typically three times the hello interval, by default, 15 seconds and 180 seconds. You can adjust the hold time with the ip hold-time eigrp command. While there is no direct way of determining what the hello interval is on a router, you can infer it from the output of show ip eigrp neighbor on the neighboring router. bandwidth = (10000000/bandwidth(i)) * 256where bandwidth(i) is the least bandwidth of all outgoing interfaces on the route to the destination network represented in kilobits. delay = delay(i) * 256where delay(i) is the sum of the delays configured on the interfaces, on the route to the destination network, in tens of microseconds. The delay as shown in the show ip eigrp topology or show interface commands is in microseconds, so you must divide by 10 before you use it in this formula. Throughout this paper, we use delay as it is configured and shown on the interface. Note: These K values should be used after careful planning. 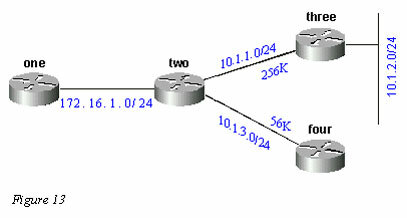 Mismatched K values prevent a neighbor relationship from being built, which can cause your network to fail to converge. Note: If K5 = 0, the formula reduces to Metric = [k1 * bandwidth + (k2 * bandwidth)/(256 – load) + k3 * delay]. 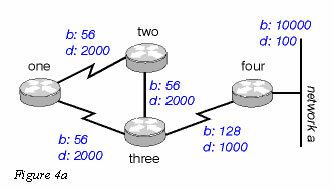 There are two routes to Network A from Router One: one through Router Two with a metric of 46789376 and another through Router Four with a metric of 20307200. 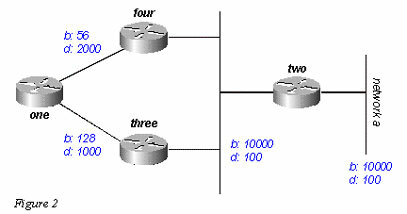 Router One chooses the lower of these two metrics as its route to Network A, and this metric becomes the feasible distance. 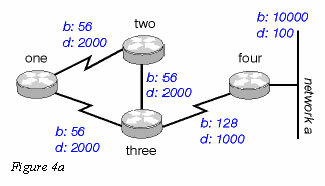 Next, let us look at the path through Router Two to see if it qualifies as a feasible successor. The reported distance from Router Two is 46277376, which is higher than the feasible distance – so this path is not a feasible successor. 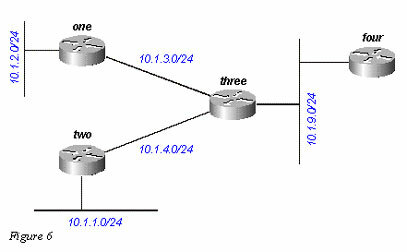 If you were to look in the topology table of Router One at this point (using show ip eigrp topology), you would only see one entry for Network A – through Router Four. 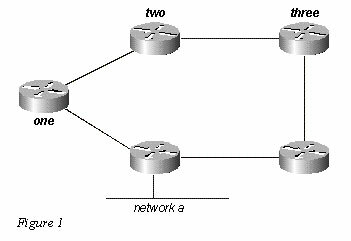 (In reality there are two entries in the topology table at Router One, but only one will be a feasible successor, so the other will not be displayed in show ip eigrp topology; you can see the routes that are not feasible successors using show ip eigrp topology all-links). 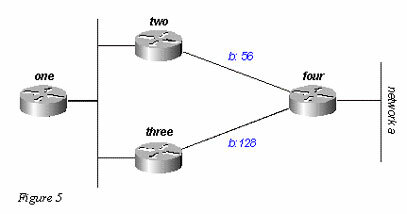 In Figure 5, Router One uses variance to balance the traffic destined to Network A between the two serial links – the 56k link between Routers Two and Four, and the 128k link between Routers Three and Four (see the Load Balancing section for a discussion of variance). 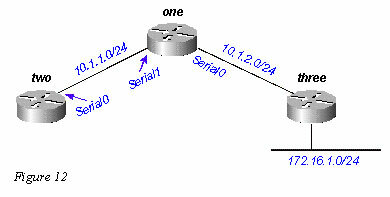 Two is redistributing this route into autonomous system 2000 and advertising it to Router One. IGRP metrics are preserved when routes are redistributed into EIGRP with a different autonomous system, but they are scaled by multiplying the IGRP metric by the constant 256. 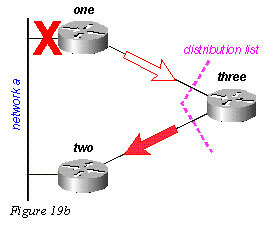 There is one caveat to redistribution between IGRP and EIGRP that should be noted. 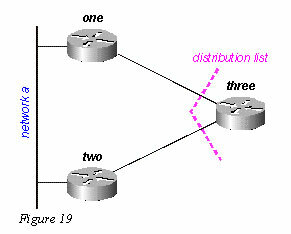 If the network is directly connected to the router doing the redistribution, it advertises the route with a metric of 1. Internal EIGRP routes are always preferred over external EIGRP or IGRP routes. 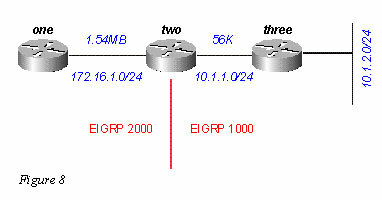 External EIGRP route metrics are compared to scaled IGRP metrics (the administrative distance is ignored). Router One advertises 10.1.4.0/24 in IGRP autonomous system 100; Router Four advertises 10.1.4.0/24 as an external in EIGRP autonomous system 100; Router Two runs both EIGRP and IGRP in autonomous system 100. 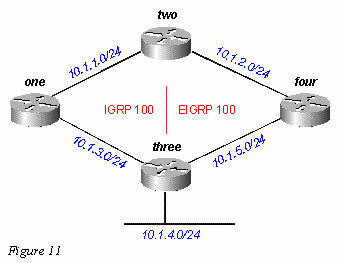 Routes redistributed into EIGRP are not always summarized – see the Summarization section for an explanation. Note the route to 172.16.1.0/24 appears as an internal EIGRP route on Router Two. This route is not marked as a summary route in any way; it looks like an internal route. The metric is the best metric from among the summarized routes. Note that the minimum bandwidth on this route is 256k, although there are links in the 10.0.0.0 network that have a bandwidth of 56k. There are some caveats when dealing with the summarization of external routes that are covered later in the Auto-Summarization of External Routes section. 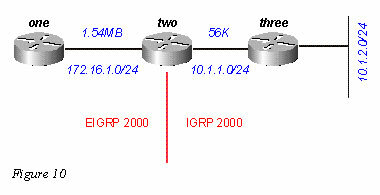 EIGRP allows you to summarize internal and external routes on virtually any bit boundary using manual summarization. For example, in Figure 14, Router Two is summarizing the 192.1.1.0/24, 192.1.2.0/24, and 192.1.3.0/24 into the CIDR block 192.1.0.0/22. EIGRP will not auto-summarize external routes unless there is a component of the same major network that is an internal route. To illustrate, let us look at Figure 15. 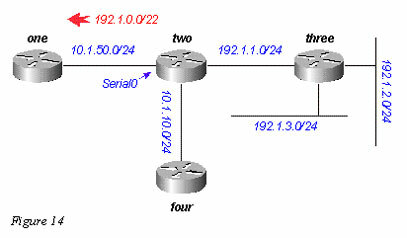 Router Three is injecting external routes to 192.1.2.0/26 and 192.1.2.64/26 into EIGRP using the redistribute connected command, as shown in the configurations below. Although auto-summary normally causes Router Three to summarize the 192.1.2.0/26 and 192.1.2.64/26 routes into one major net destination (192.1.2.0/24), it does not do this because both routes are external. However, if you reconfigure the link between Routers Two and Three to 192.1.2.128/26, and add network statements for this network on Routers Two and Three, the 192.1.2.0/24 auto-summary is then generated on Router Two. 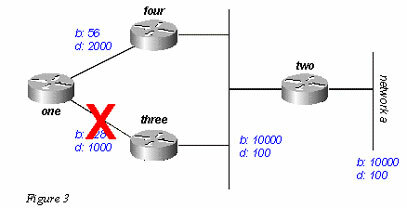 The actions in the table above impact the range of the query in the network by determining how many routers receive and reply to the query before the network converges on the new topology. To see how these rules affect the way queries are handled, let us look at the network in Figure 16, which is running under normal conditions.